VANCOUVER, BRITISH COLUMBIA--(Marketwired - Feb. 11, 2014) - Prophecy Coal Corp. ("Prophecy" or the "Company") (TSX:PCY) (OTCQX:PRPCF) (FRANKFURT:1P2) announces that on February 3, 2014, it granted, in aggregate, 500,000 stock options ("Options") to an officer of the Company. The Options have been granted pursuant to the terms of the Company's Stock Option Plan, which was approved by shareholders at the Company's annual general and special meeting of shareholders that was held on July 30, 2013. The Options are exercisable at $0.10 for a term of five years expiring on February 3, 2019 and vest at 12.5% per quarter for the first two years following the date of grant and is subject to the approval of the Toronto Stock Exchange. Ulaanbaatar, February 11 (MONTSAME) At the Stock Exchange trades held Tuesday, a total of 28 thousand and 153 shares of 22 JSCs were traded costing MNT 48 million 815 thousand and 587.55. 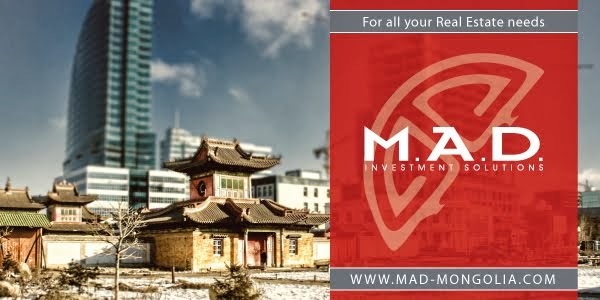 "Remikon" /12 thousand and 550 units/, "Gobi" /5,336 units/, "Moninjbar" /5,000 units/, "Genco tour bureau" /1,555 units/ and "Mongolia Development" /1,109 units/ were the most actively traded in terms of trading volume, in terms of trading value--"Gobi" (MNT 30 million 417 thousand and 960), "Gazar suljmel" (MNT two million and 394 thousand), "Sharyn gol" (MNT two million 096 thousand and 920), "Remikon" (MNT one million 948 thousand and 160) and "Moninjbar" (MNT one million and 650 thousand). The total market capitalization was set at MNT one trillion 686 billion 738 million 191 thousand and 732. The Index of Top-20 JSCs was 16,711.61, decreasing by MNT 38.59 or 0.23% against the previous day. Ulaanbaatar, February 11 (MONTSAME) In 2014, the 1.6 mln.shares valued at 917.8 mln.tog were traded in securities trading. The trading went down by 3.3 bln.tog or 78.4 percent, the shares--by 7.1 million or 81.2 percent against the same period of 2013. 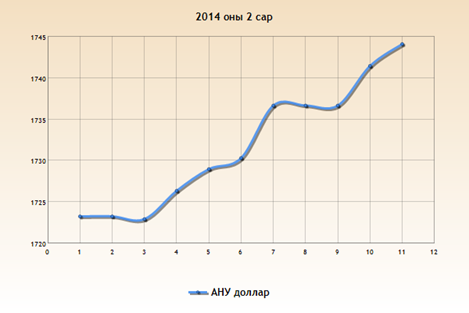 February 11 (Cover Mongolia) Bank of Mongolia announced today that it has maintained policy rate at 10.5%. In another decision, BoM has decided to exempt foreign currency sourced from overseas via 3-year or longer bonds or loans from the mandatory reserve requirements. An English version will be posted once we obtain one. · Олон улсын зах зээл дээрээс 3 болон түүнээс дээш жилийн хугацаатай бонд болон зээл хэлбэрээр банкны татсан гадаад валютын эх үүсвэрийг Заавал байлгах нөөцийн шаардлагаас чөлөөлөх. Өнгөрсөн хугацаанд эдийн засгийн гадаад орчин сайнгүй, төлбөрийн тэнцлийн дарамт өндөр байсан боловч, төрийн зохицуулалттай бараа үйлчилгээ (ТЗБҮ)-ний үнийн өсөлтийг эс тооцвол инфляци зорилтот түвшний орчимд байна. Эдийн засгийг тогтворжуулах, эдийн засгийн өсөлтийг дэмжих Монголбанк, Засгийн газрын хамтарсан дунд хугацааны хөтөлбөрүүдийг үргэлжлүүлэхдээ уг хөтөлбөрүүдийн үр ашгийг дээшлүүлэхэд анхаарч ажиллах нь чухал гэж үзэв. Гэвч гадаадын хөрөнгө оруулалт буурч, эдийн засагт өндөр ач холбогдолтой томоохон төслүүдийн хэрэгжилт он дамжин удааширсаар байгаа нь эдийн засгийн дархлааг сулруулж, макро бодлогын үндсэн сорилт болж байна. Түүнчлэн, 2013 оноос шинээр бий болсон улсын төсөвтэй адилтгах зардал, түүний тодорхой бус байдал нь мөнгөний бодлогын хэрэгжилтийн үр дүнг сулруулж байна. Зөвлөлийн хурлын хураангуй тэмдэглэлийг 2 долоо хоногийн дараа Монголбанкны цахим хуудаст байршуулна. February 11 (Bank of Mongolia) On the Foreign Exchange Auction held on February 11th, 2014 the BOM has received from local commercial banks bid offer of USD and CNY. The BOM has sold 39 million USD and 42.0 million CNY to the local commercial banks. On February 11th, 2014, The BOM has received USD Swap agreement offer of 36.5 million USD accepted the offer. In addition, The BOM has received the offer to extend the time period of CNY Swap agreement of 20 million CNY and accepted the offer. Ulaanbaatar, February 11 (MONTSAME) The national consumer price index this January increased by 1.7% against the previous month and by 12.3% against the previous year. This increase occurred due to price growth of food and non-alcoholic beverages by 3.4%, transport by 2.5%. Ulaanbaatar, February 11 (MONTSAME) The Bank of Mongolia reports that money supply (broad money or M2) at the end of this January reached 10,027.9 bln.tog, increasing 576.9 bln.tog or 6.1 percent against the previous month. 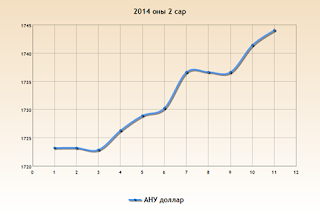 The money supply went up by 2,687.2 bln.tog or 36.6 percent compared to 2013. By late January, currency issued in circulation reached 894.3 bln.tog, increasing 53.2 bln.tog or 6.3 percent against the previous month, and by 152.2 bln.tog or 20.5 percent against 2013. Loans outstanding amounted to 11,014.9 bln.tog, going up by 245.6 bln.tog or 2.3 percent compared against the previous month, and increasing by 3,875.1 bln.tog or 54.3 percent against the same period of 2013. Principals in arrears at the end of January 2014 reached 152.1 bln.tog, showing an increase of 33.9 bln.tog or 28.7 percent compared to the previous month and an increase of 46.3 bln.tog or 43.8 percent compared to 2013. The non-performing loans over the bank system reached 581.9 bln.tog, increasing 15.9 bln. tog or 2.8 percent against the previous month and increasing 274.7 bln.tog or 89.4 percent against the same period of 2013. Ulaanbaatar, February 11 (MONTSAME) In January 2014, total equilibrated revenue and grants of the General Government Budget (GGB) amounted to 348.4 bln.tog. Total expenditure and net lending amounted to 413.1 bln.tog, representing deficit of 64.7 bln.tog in the equilibrated balance of GGB. Compared to same period of 2013, tax revenue increased by 0.6 bln.tog or 0.2 percent mainly due to the decreases of 14.4 bln.tog or 42.6 percent in other taxes revenue and of 14.0 bln.tog or 20.9 percent in income tax revenue, although there was increases of 14.1 bln.tog or 11.8 percent in taxes on domestic goods and services, of 9.7 bln.tog or 18.6 percent in social security contributions, and of 3.4 bln.tog or 15.7 percent in taxes on foreign trade. In January of 2014, total expenditure and net lending of the GGB increased by 145.9 bln.tog or 54.6 percent to 413.1 bln.tog against the same period of 2013. This happened due to increases of 65.5 bln.tog in capital expenditure and of 59.8 bln.tog or 50.3 percent in subsidies and transfers. However, there was a decrease of 15.5 bln.tog in lending minus repayments. Ulaanbaatar, February 11 (MONTSAME) The Minister of Construction and Urban Development Ts.Bayarsaikhan gave a report on works of 2013 and on goals of this year, at the weekly "Hours of construction" meeting on Monday. The construction industry increased by 70% last year, 20 thousand flats were put into use in the city and 7,000 thousand flats--in localities, and 14 thousand 685 people received the eight-percent mortgage loans, he said. Loans of 430 billion togrog were given to 97 companies for the financing of uncompleted constructions of apartments, most of the buildings are expected to be put into use this year, "so the supply of apartments will increase". One of the six sub-programes on price stabilization, implemented by the cabinet for reforms, is running at the construction sector. "Our policy focuses on supporting the domestic industry of construction instead of stabilizing prices of construction materials in 2014, and we will stop an import of cement and armatures by 2015," the Minister emphasized. This Ministry is working on a general plan for designing the great construction works, and all aimags will have their general plans of construction by 2014. Apart from the construction works, parliament passed last year clarifications to general plan for developing UB until 2020, also a document on developmental tendencies until 2030, and a draft law on addresses, whereas the cabinet approved a resolution on providing all streets, roads, squares and real estate with addresses, he said. The Minister also noted that parliament is expected to discuss many important bills on construction, on land, on re-developing city, on changing status of settlements, on parking lots and on classifications of Ulaanbaatar territories. February 10 (Mongolian Economy) The Mongolian Bankers Association reports that the Ulaanbaatar Representative Office of Bank of Tokyo-Mitsubishi UFJ (BTMU) has joined the Mongolian Bankers Association. The BTMU is the largest bank in Japan, founded in 2006 with the merger of the Bank of Tokyo-Mitsubishi, Ltd. and UFJ Bank Ltd. The BTMU you has more than 1,500 offices in Japan and over 40 offices in other countries. The bank serves as the core retail and commercial banking arm of the Mitsubishi UFJ Financial Group. In December 2013, BTMU announced the opening of its representative office in Ulaanbaatar, after receiving official approval by the Bank of Mongolia. The bank has provided financial support to the Mongolian business of Japanese companies through services including project finance and trade finance. With the establishment of a representative office, BTMU will strengthen its ability to collect information in a bid to better accommodate customer needs. The Mongolian Bankers Association is delighted to welcome the BTMU Ulaanbaatar Representative office as a member and hopes to have a fruitful collaboration in the future that will contribute to the sustainable economic development of Mongolia. February 11 (news.mn) Internet service providers held a protest on Monday on Chinggis Square against the Government`s resolution 410 to limit the service hours of internet cafes to no later than 7:00 pm and banning any service over-night. Protesters and internet service providers held banners saying "Do not limit the free-time of young people" and "E-Sport is not a crime". There are hundreds of internet cafes in Ulaanbaatar City and sub districts providing computer, printing, scanner rental, training, PC gaming and Internet access to people who do not have computer or internet access at home. The number of internet cafes that offer customer the option to stay overnight for PC gaming is still growing. A large number of visitors to internet cafes are teenagers and children. The standards and services of internet cafes in Ulaanbaatar city and sub districts are often poor. February 11 (Embassy of Mongolia in Australia) Australia-Mongolia Business Council, a body aimed to promote the mutually beneficial economic, investment and business interests of Mongolia and Australia was registered by the Australian Securities and Investments Commission on 28 January 2014. Mr Mark Green, International Managing Partner of Minter Ellison Lawyers has been elected as the Chairman of the Council. 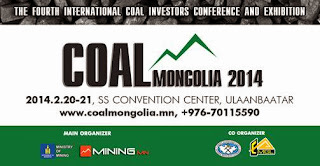 In recent times, the level of investment into Mongolia from Australia has risen significantly. There are around 30 Australian companies that have established their local office in Mongolia and 170 small-medium sized companies linked with Mongolia. Embassy of Mongolia in Australia was supportive of establishing a business council initiative from the beginning. Australia Mongolia Business Council intends to host a number of events in Australia to facilitate the sharing of experiences of doing business in Mongolia. Ulaanbaatar, February 11 (MONTSAME) Ulaanbaatar districts governors Monday convened to discuss prevailing problems in their administrations. Bayanzurkh district head D.Purevdavaa stressed a need to solve an issue related to an untenable facility in the district, which has been built in three year time, under a funding of 521 million togrog. When the construction was completed last year, the Professional Inspection Agency rated it as inhabitable due to water in the foundation of the building. The Inspection Agency also found buildings of one school and one kindergarten as inhabitable in the district. However, the cost of the demolition has not been included in the budget for 2014, the Governor said. The meeting assigned Yo.Gerelchuluun, a chairman of the Capital city Governor's Office, and district governors to discuss all the issues including the above-said and others at the Capital city managing board meeting in presence of relevant officials. February 11 (infomongolia.com) First consultative meeting between the Ministry of Foreign Affairs of Mongolia and Ministry of Foreign Affairs and Trade of New Zealand was held at the Ministry of Foreign Affairs of Mongolia (MFA) in Ulaanbaatar on February 10, 2014. At the meeting, both sides exchanged views on bilateral relations, multilateral cooperation and mutually interested regional issues. Mongolia and New Zealand attached a great importance to the consultative meeting as the both countries share common similarities of agriculture being the pillar of its economies and small nation with a low population in the Asia Pacific. New Zealand's agricultural exports reached 10 billion USD in 2013. New Zealand is a candidate for election to the United Nations Security Council for a two-year term from January 2015 until December 2016. The elections will be held in New York at the UN General Assembly in October 2014. Mongolia introduced New Zealand's new public management experience in the state services and Mongolian public servants studied in New Zealand thanks to the New Zealand Government grant over the last ten years. Mongolian side was led by Mr. Ts.Batbayar, Director of the Department of Policy Planning and Research, MFA, and the New Zealand side was led by Mr. G.Morton, Director-General of the North Asia Division at the Ministry of Foreign Affairs and Trade of New Zealand. On the same day, Director-General G.Morton paid a courtesy call on Mr. D.Gankhuyag, Deputy Minister for Foreign Affairs of Mongolia, reports the MFA. Mongolia and New Zealand have established the diplomatic relations on April 08, 1975. DENVER, February 11 (AP) -- A lawsuit in Denver's U.S. District Court names a "fossilized Tyrannosaurus bataar skull" as the defendant. The legal maneuver essentially repatriates the skull, 67 million years after the dinosaur's demise, as if it were a living, breathing Mongolian citizen. The giant oval skull with long razor teeth will soon join a world-wide migration of dinosaur bones to a museum in the Mongolian capital city of Ulan Bator. U.S. judges began ordering the return of dinosaur bones to Mongolia after U.S. Department of Homeland Security officials and Tsakhiagiin Elbegdorj, the president of Mongolia, came to an understanding about how to redress fossil smuggling two years ago, said Houston attorney Robert Painter, who represents Elbegdorj in his quest to repatriate Mongolian dinosaur bones. The lawsuit against the skull of a T. bataar, a dinosaur cousin of T. rex, came on the heels of a guilty plea in a criminal case against 69-year-old Eagle dinosaur vendor Rick Rolater in federal court. Rolater sells rare gems, petrified wood tables and mammoth tusks in his pricy Jackson Hole and Beaver Creek shops, By Nature Gallery. Over the past 20 years, dinosaur bones stolen from the Gobi Desert's Nemegt Basin, sometimes in midnight smuggling raids, eventually found their way to buyers. Wealthy private collectors were willing to pay up to $1 million for a full T. rex skeleton. Another debate is raging over another T. bataar fossil, one bought by "National Treasure" actor Nicolas Cage for $267,000 after he outbid actor Leonardo DiCaprio at a Beverly Hills auction house in 2007. Rolater, reached while attending the Tucson Gem and Mineral Show, where museum curators can find dinosaur fossils from around the world for sale, said he could not comment. February 11 (FIFA.com) With a population of less than three million, Mongolia is not usually associated with significant footballing achievement. The world's second largest landlocked country – neighbouring Kazakhstan is the largest - Mongolia have yet to establish a professional league where their young talents can emerge and develop. Every cloud has a silver lining, though, and as the Mongolian supporters have been longingly hoping for, a promising star is quickly making a name for himself. Murun Altankhuyag, one of the country's promising young stars, secured an eye-catching two-year contract with Thai first division side Krabi FC at the start of this year, making him the first professional footballer from the emerging Asian nation. The 24-year-old striker, who previously played with university side Central Methodist Eagles in the United States, didn't conceal his excitement when speaking to FIFA.com in an exclusive interview. "I have been looking to become a professional footballer for many years," Altankhuyag said. "And finally I have made it. I am so happy because all I have ever wanted - to eat, sleep and train - has been secured. I know this is just the start of my career and I will work hard. I still have a long road to travel." Krabi FC open their campaign at Nakhon Prathom on 23 February and Altankhuyag is already itching to showcase his talents for his new club. "I want to do my best and help my team as much as possible," he continued. "I especially want to play for my national team because the Mongolian people want to see me play." Born in the Mongolian capital, Ulaanbaatar, Altankhuyag started playing football at the age of 12. With horse-racing and wrestling the dominant sports in the country, kids usually begin playing football in the streets but Murun was lucky to have a mentor guide him along the way - his coach Chultem Sharkhuu. "He was like my father," Altankhuyag said. "He taught me a lot of things about football as well as life." Though he was not an early starter, Murun set a lofty goal to become one of the best players in his country. Altankhuyag explained how he modeled his play after Brazil star Ronaldinho in order to focus his training: "He is my favourite player. I used to learn from him as I watched him play. I like his playing style, moves and techniques," he said. Murun development was strong enough to earn his first cap for Mongolia in 2007. As a teenager, he started in a 4-1 home defeat to Korea DPR in a 2010 FIFA World Cup South Africa™ qualifier. He continued to progress after he moved to Missouri the following year during spells with Hannibal-LaGrange University and the aforementioned Central Methodist University. "I had to work and study in USA, so to be honest it was difficult to concentrate on football. Often I only had time to train after a full day of working and studying so I was very tired. But through tough training, I became physically stronger and faster. I also improved mentally and became hungrier to win," he smiled. Altankhuyag's move raised many eyebrows, even in his adopted land. The last time Mongolian footballers made a showing in Thailand dates back to the 1998 Asian Games in Bangkok, where they conceded 26 unanswered goals over two matches, including suffering a record 15-0 loss to Uzbekistan. With Murun's arrival, though, the locals are expecting the Mongolian international to make an immediate impact for Krabi FC, who finished ninth in Thailand's second-tier league last season. "Murun is a very good player, which is why we signed a professional contract with him," remarked Krabi FC President, Somkiat Kittidhrakul. "This is also the start of a good relationship between Krabi and Mongolia. I want many Mongolian people to support Krabi FC and Mongolian companies to sponsor our club." Altankhuyag's transfer to Krabi FC marks another monumental step on the youngster's path to become as good as compatriot Donrov Lkhumbengarav. "He is the greatest player in our country," Altankhuyag said. "It is every player's dream to be well-known and I want to be a big star like him." February 11 (Metro New York) In 2010, football writer Paul Watson led the tiny Pacific island of Pohnpei to its first ever win, the culmination of an adventure with friend Matthew Conrad in pursuit of the soul of the game. Their story served as inspiration for the film "The Soccermen," to be released this year. Watson, 29, has now taken over an even greater challenge as manager of new Mongolian team Bayangol FC, based in the region of Ulan Bator, where the winters reach -40°C and nobody speaks English. Ulaanbaatar, February 11 (MONTSAME) The administration of the eastern Dornogobi aimag has decided to host a camel polo instead of a winter horse race planned. The Mongolian Camel Polo Federation is planning to run their annual polo contest in the center of this locality on February 15-16, in a partnership with the Ministry of Industry and Agriculture and the Ministry of Culture, Sport and Tourism. Camel herders from Gobi provinces of Dornogobi, Bayanhongor, Ovorkhangai and Gobi-Altai will take part in the events. Ulaanbaatar, February 11 (MONTSAME) Our team to take part in the Sochi Paralympics will wear cashmere outwears at the opening and closing ceremonies of the Games. The Gobi cashmere concluded a cooperation agreement with the National Olympic Committee on Monday to provide the Paralympic team of 10 sports people with cashmere shirts, trousers, berets, scarfs and waistcoats in the same color as the national flag–red and blue. Cross country skier B.Ganbold will represent Mongolia at these Paralympic Games, which will take place March 7-16. Mogi: looks like Goyo messed up, and Ariunaa Suri to the rescue. February 11 (UB Post) Outfits of the Mongolian athletes and coaches to participate in the Sochi 2014 Winter Olympics have become a hot topic among social media, receiving both praises and criticisms. Following is an interview with Ariunaa Suri, the designer of the outfits worn by the Mongolian Olympic team, about her recent participation in the Winter Olympics, her fashion career and ambitions. -How did you come up with the idea for the general design with hats, gloves and scarves for the outfit of the Mongolian athletes who are to participating in the Sochi 2014 Winter Olympics? -The Ministry of Culture, Sports and Tourism phoned me to go to the Olympics Committee to assist with the outfits for the Olympic opening ceremony. I went there despite my workload as it held our nation's image in hand. When I went there, I realized that minor changes were needed and changed the hats, gloves and scarves in order to brighten up the whole outfit without changing the basic clothing such as the coats. The coats were impossible to alter. Outfits worn during the opening ceremony and the usual outfits worn on other occasions did not correspond to one another. Olympics outfits look better if they all somehow match. The two dark navy pieces was alright for the parade. However, I was stuck on ideas to match hats and gloves to the other outfits, worn on other occasions. There were many different outfits with a variety of colors but few options and so I chose azure blue. 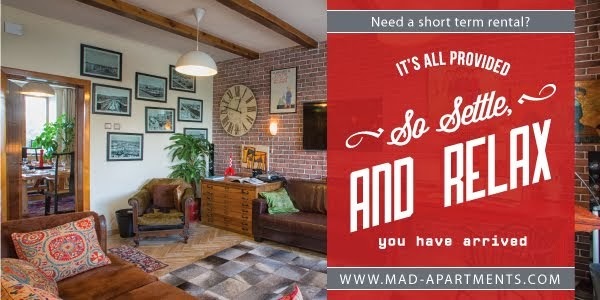 -Were you short on time? -I had only three to four days. Many other counties had also chosen azure blue. Nevertheless, Mongolia has many symbolic attachment to the color and nothing could go wrong with the color. In my opinion, the word Mongolia needed to be added to the label, as "Goyo" that was written on the label had nothing connecting the attire to Mongolia. Red matched azure blue. Dark navy also would've matched. When colors such as red were added, all the colors became too much. People started to criticize, saying that we might as well add all five colors of the Olympic symbol. There's color accord and specific sewing machines needed for it. In Mongolia, we do not have technologies with such capabilities and so we had to tune our current technologies. People need to understand that we do not work in big Italian warehouses. We're obviously working towards that. We asked every cashmere factories of Mongolia to find azure blue color since we didn't have the time to make the color. I would like to express my gratitude to Buyan Cashmere because they gave as much to complete the task by making ten hats and scarves until the evening of Lunar New Year. -People sent it through facebook and twitter. I received praises and thanks from many people. However, efforts from many people were attributed in this, not just me or my colleagues. There's graphic designer Ts.Dorj who helped with the design of the national emblem and inscription of logo. Some were thinking that it would have been better if we wore deels. It all depends on where and when you're wearing it. We should show that we've advanced in technologies and are striking higher, through at least the fashion sector. At least show development and upper hand in cashmere. In my opinion, no matter if it's a small or big competition, athletes who are becoming the face of Mongolia should meet standards of some level in every aspects whether its clothing or whatever to our participate in competitions. I wish the government would provide more support. Athletes should be determined and given rights a year before 2016 Summer Olympics, meet some requirements and then participate. Or athletes will stand there with whatever outfits they have at the time. Now everyone watches from the internet and we're living in a harsh world where criticisms are plentiful. We cannot approach the matter half-heartedly, by dismissing the issue and letting athletes sort out their outfits. -You have also said that there weren't any standards when making outfits for airline personnel. Generally, Mongolians seem to interpret fashion as just clothing? -There are two main aspects of living; eating and clothing. Do we want to be recognized as people of a certain nationality? Frankly speaking, are we upholding traditional styles? We must take our nomadic lifestyle to wherever we need to take it. However, how many current Mongolians are there living in a sedentary culture? They're all trying to modernize and it needs to be thought thoroughly. Same goes for air transportation. I received requests for uniforms and I'm trying to make it into something. There's still a question mark, I don't have to make it. The main goal is to make clothes that meet international standards. Designing is not something a spoilt girl does. -You seem to be very busy and in demand? -Many proposals do come. Our aim is to concentrate on new designs so we don't accept all requests. I am delighted to receive their proposals and want to do it. However, I don't get enough time to create new collections. -You have stated before that "how much longer are we to talk about national things." From this huge industry of fashion, how will your designs diverge? In other words, how will the things you learnt from the external world be shown in your designs? -Mongolian aspects are already in my designs. I don't need to change that factor but focus on how to introduce it to other people. I like to contemplate on how the people wearing it can be satisfied and confidence. For instance, say there was a man; I would make outfits on the way I want it to look on him. From the outlines and arrangements, you will be naturally able to see that it's Mongolian. -To design, how much comes from the aesthetic sense? -Aesthetic sense is the priority. Whether you excel in sewing or drawing, you cannot set off or design if you don't have the sense. There are times when you become senseless. My world is surrounded by many people and it should be affected by them. My world needs to modernize and change constantly. If my everyday lifestyle is active, I become tuned to it. For instance, when I stroll through a picturesque view, listen to music or see an exhibition. -I have never been self-confident. I'm never content with my work. Actually, I'm waiting for the day I become self-confident; a day when I can finally say that I have done something. My mentor said to me that being discontent with oneself was the key to success. Sometimes, when I look back on the things I have done, I do think that I have done great things. For instance, when I see myself on so many magazines during my years as a student in Germany. -Sometimes people like to stay alone in silence. Perhaps it may be connected to your profession, but in your view, has your past always been busy? -There are times when I become still. I used to basically race with time. Nevertheless, I have never procrastinated and tried to manage everything. Frankly, you start managing things as you do them. It's fun to occasionally waste time with nothing to do on your hands. -People usually learn by working under pressure from a young age. What is it like for you? -I used to go to four to five clubs when I was young . They include clubs for swimming, skiing, figure-skating, physics, drawing and dancing. I was busy but good at them. I was a very active child and would usually win in competitions. -Out of all those clubs and skills, you chose designing. Was this truly your dream? -My mother tried hard to make me a painter. That must have been a huge stepping-stone for this profession. Big mentors such as llya Repin and Vasily Surikov influenced me and my intuition grew. I also learnt a lot by following my teacher Lhavgasuren. He would often praise the subject of my drawing despite my poor drawing skills. Looking back now, although I was little, I would draw things with big subjects. -You face many financial difficulties when producing your work. How are you managing it? -I can't really decide. The Ministry of Culture, Sports and Tourism has supported the fashion industry for the first time. They used to support arts and sports more. Truthfully, the industry that will bring financial income back to Mongolia is fashion. It is essential to producers who will balance imports and exports. Fashion designers are always trying to export their goods, so the government chose the right sector to support. For instance, if Mercedes Benz didn't support me, I wouldn't have come to the spotlight. Nevertheless, it doesn't just end with recognition, you need to actively take part in big events regularly. Shows are a way of selling products that take place on stage. If I receive customers by participating in shows, I will have products produced by domestic factories. Being able to participate in Mercedes Benz is like winning a gold medal in the fashion industry, similar to when our athletes win gold in Olympics. So, I hope they continue supporting the industry. -My short term plan is to complete my 2014 and 2015 fall designs. As for the long term, I would like my brand to enter the world market, because I'm producing relatively little at the time. February 11 (news.mn) The extremely contagious foot and mouth disease continues to spread to livestock despite the best efforts of locals and the National Emergency Management Agency. As of 9th February, 286 from 290 foot-and-mouth affected cattle belonging to 60 herders in Sukhbaatar aimag have been destroyed. According to a report from February 9th, almost 217,000 livestock have been vaccinated in Ongon, Naran, Dariganga, Bayandelger and Tuvshinshiree sums in Sukhbaatar aimag in an action to prevent the spread of foot-and-mouth disease. A total of 160,670 livestock made up of 333 camels, 14,451 cattle, 65,585 sheep and 47,142 goats in the quarantine area have been involved in a Veterinary Wellness Exam & Medical Check-up. On February 9th, Elgen shand in Sangiin Dalai bag, a small unit of the local administration 50 km away from the center of Galshar sum in Khentii aimag and Khar tolgoi in a small unit of the local administration of Jargalant, 20 cattle belonging to six farmers were found affected with foot and mouth. Emergency Management Commissions in aimags have set a high alert to prevent an epidemic in the territory of Sukhbaatar and Dornogovi aimag and their neighboring sums Bayankhutag, Bayanmunkh, Darkhan, Bayan-Ovoo, Kherlen and Bor-Undur sums neighboring to Galshar sum. It is reported that Galshar sum in Khentii aimag is inhabited by over 11,000 Mongolian gazelle. The governors of Galshar, Bayan-Ovoo, Darkhan, Bayankhutagt and Bayanmunkh sums have been ordered to conduct surveys in the habitat of the gazelle in order to eliminate any affected gazelle and send samples to the laboratory. The General Agency for Specialized Inspection has warned citizens against any unnecessary travel to quarantined zones where foot-and-mouth has been found in Sukhbaatar and Khentii aimags.